This Chinese language app has audio for words, translations, and example sentences! It is the fastest way to learn Chinese because it has test functions and a function that allows users to repeatedly work on their weaknesses. Official HSK Vocabulary Training is a Chinese vocabulary learning app that is based on the official HSK Chinese language proficiency tests conducted by the Chinese government around the world. This app is made by Sprix. The app teaches Chinese words necessary to pass the HSK according to the different levels, and the examples are based on sentences actually used in the tests. 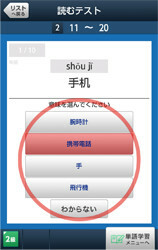 Users can study by simply tapping on the screen of their smartphone, so they can quickly learn Chinese words. There are audio files for all words, examples, and Japanese translations, so that this app can also be used to study Chinese listening which is a weakness of many people studying Chinese. This app can also be used to listen-and-learn so that it can be used anywhere and at any time, such as during a commute. HSK Vocabulary Training has many functions that students of the Chinese language will find convenient. It is perfect for people who want to pass the HSK as quickly as possible! HSK covers all the basic Chinese words, of course, so even people who do not plan on taking the tests can learn Chinese in a fun way. 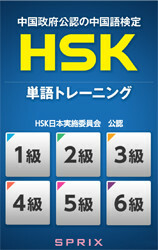 HSK has six levels from the lowest grade one to the highest grade six. If you are just starting to learn Chinese, then you should start from grade one. HSK is a Chinese language test that is certified by the Ministry of Education of the Chinese government. Of the many Chinese language tests, HSK is the most widely recognized around the world and it is conducted in 118 countries and regions. Copyright © SPRIX All Right Reserved.